Hurricane Spin Dust motorized dusting wand is the painless way to dust your home. Dusting is back-breaking work. Your old feather duster spreads dust everywhere, while using a cloth and spray is downright tedious. Hurricane Spin Duster is the motorized duster that eliminates dust in half the time. When you&apos;re ready to dust, just press the button and Hurricane Spin Duster starts spinning. All you have to do is glide it over your dusty surface. Hurricane Spin Duster practically does the work for you! When you use a feather duster, microfiber duster, or a generic bristled dust brush dust is pushed around. It goes back into the air and lands on another surface. You home isn&apos;t really clean. Hurricane Spin Duster has special electrostatically-charged bristles that attract and trap dust. The removable dust heads keep dust locked in the bristles until you wash the soft bristles. Fitting your dust wand in small spaces is a big challenge. It&apos;s almost impossible to dust mini blinds and shutters and office necessities like keyboards, laptops and monitors. Hurricane Spin Duster&apos;s ultra-soft bristles conform to any shape. It&apos;s perfect to get tough-to-reach areas like corners, crevices and space between appliances. Easily evict those dust bunnies residing at the bottom of your glass vase. Feather dusters aren&apos;t meant to be washed. Each time you reuse that dirty duster, you&apos;re spreading dust particles (and possibly dust mites) around on your furniture. Gross! 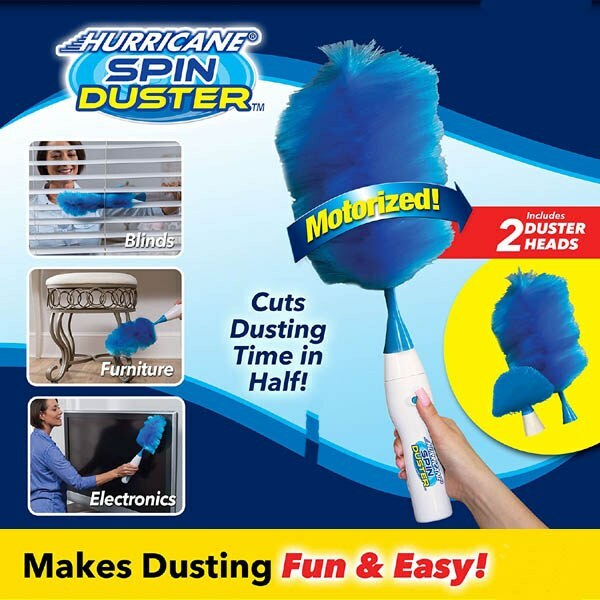 Hurricane Spin Duster has removable dust heads that are washable. Just remove the dust head, rinse under water, then allow to air dry. You clean with a fresh dust head each time you dust. Hurricane Spin Duster is more than your generic old duster. It&apos;s a dusting system. Each Hurricane Spin Duster includes the Hurricane Spin Duster, two unique dust heads, and extension rod. Uses 4 AA batteries (not included). Works like it says it does!!! !